As sub-consultants to Grimm & Parker Architects of Calverton, Maryland, L.S. 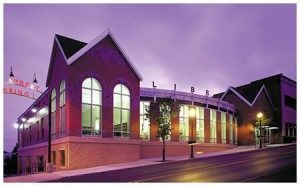 Grim Consulting Engineers was responsible for all mechanical, electrical, and plumbing issues associated with the design of a new town library for the city of Frostburg, Maryland. The project involved taking an existing municipal parking lot and creating a two level library, with a lower level public parking space under the library above. L.S. Grim Consulting Engineers was responsible for all mechanical, electrical, and plumbing issues within the library, such as central HVAC systems for the proper conditioning of display, artifact, and book materials within the library and support rooms. L.S. Grim Consulting Engineers was also responsible for utility service entrances to the building for mechanical, water, sewer, and natural gas; fire alarm systems for the building; display and stack lighting; incidental convenience outlets as well as Category 5 data wiring and telephone wiring for the various library functions. In addition, this library houses the central internet service for the Allegany County Library System and we provided the specialty HVAC and electrical requirements for the data facility. We would welcome an opportunity to discuss your project, complete the form below and we will get back with you shortly.